It’s probably America’s most controversial list. You can be put on it without your knowledge, and getting off it is extremely difficult. It’s the federal no-fly list, a collection of names of people who are not allowed to board commercial flights into or out of the United States. According to leaked documents obtained by The Intercept, more than 47,000 people were on America’s no-fly list as of August 2013. That number reportedly includes 800 Americans, many of whom don’t even know they’re on it. The government sends no official notification to those on the list; many times, people don’t find out until they’re denied boarding at the airport. A number of high-profile lawsuits have claimed the government unjustly added people to the list and blocked their efforts to have their names removed. Last summer, a federal court ruled in favor of 13 people who claimed the government violated their constitutional rights to travel by placing them on the no-fly list. The government was ordered to tell the plaintiffs whether they’re on the list, spell out the reasons they are barred from travel, and to give them a chance to challenge the government finding. The case was one of the biggest challenges yet to the super-secret government list, but the veil that shrouds the no-fly list still remains. “There is this black box procedure which operates purely behind the curtains and no one is able to part those curtains and find out what really goes on,” airline industry analyst Robert Mann explained to Yahoo Travel. The government maintains that the secrecy about the no-fly list is necessary for national security. A potential terrorist can be tipped off that the government is watching him, the logic goes, if he gets a letter saying he’s now on a government blacklist. Despite the secrecy, various court cases, news reports and leaked documents have shed some light on the process behind the no-fly list. Here are eight possible ways one can end up on it. According to The Guardian, the Justice Department has also said that authorities must have a “reasonable suspicion” that someone poses a threat before they put them on a watch list. However, civil liberties activists have argued that "reasonable suspicion” is extremely subjective. There are numerous complaints from non-violent political activists who say they ended up on a no-fly list for something they said. Former Princeton University professor Walter Murphy told The Guardian that in 2007, he was denied a boarding pass in Newark International Airport. He suspects it was because of a high-profile lecture he gave that had been critical of then-President Bush. In 2012, Wade Hicks, the spouse of a Navy lieutenant, claimed he was told he was on a no-fly list. He thinks it was because of comments he made about 9/11. This is a common complaint from those who claim they are on the no-fly list unjustly. “If you have a name which is similar in sound or spelling or in phonetical interpretation to someone who probably legitimately should be on the list, you’re at risk for finding yourself on the list,” says Mann. He cites a friend of his who shares a last name with an Irish Republican Army operative who was active in the 1960s and 1970s. That unfortunate coincidence, says Mann, landed not only his friend on the list but also the man’s son — who wasn’t even born during this operative’s heyday. In 2007, 60 Minutes famously brought together a group of people named Robert Johnson who experienced problems flying, likely because a man also named Robert Johnson had been convicted of plotting to bomb a Hindu temple and a movie theatre in Toronto. According to a federal lawsuit heard in New York this summer, four Muslims say they were put on the no-fly because they refused to spy for the FBI. The men’s names were removed from the list but they sued FBI agents for damages. According to a lawsuit detailed in Wired magazine, a Stanford University doctoral student was placed on the no-fly list in 2004. After seven years of federal lawsuits, it was determined she was unjustly put on the list because an FBI agent had checked the wrong box on a form. Mann says you may not even have to be suspected of terrorism to get on a no-fly list. “In some cases, people have either open warrants or some other characteristic indicating criminal activity and then they find themselves on this list,” he says, even when the alleged activity has nothing to do with aviation security. 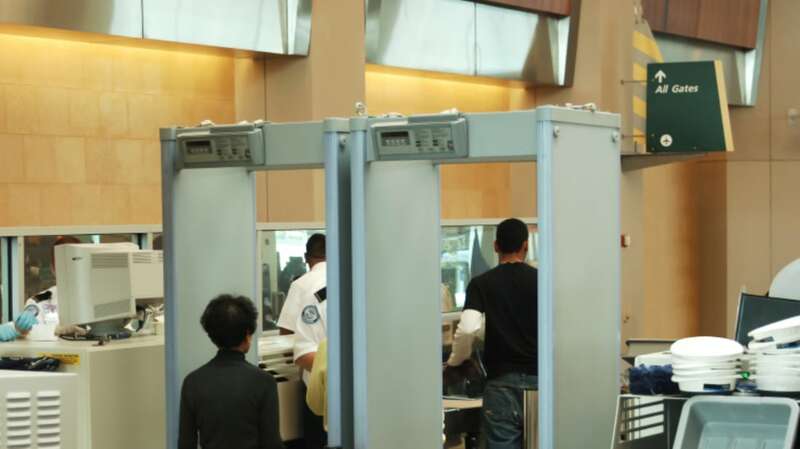 Mann believes that’s a sign the no-fly list has morphed beyond an air security tool into an all-out law enforcement tactic. “This has mission-creeped into something that is much wider in scope than was originally intended,” he says. The government, either via policy change or court order, has made some changes to the no-fly list that have opened up the process somewhat. But everyone agrees, it’s still a slow and secretive process.